Summer break is just around the corner and with students away from their books and routines, your tutoring business may experience a seasonal lull. 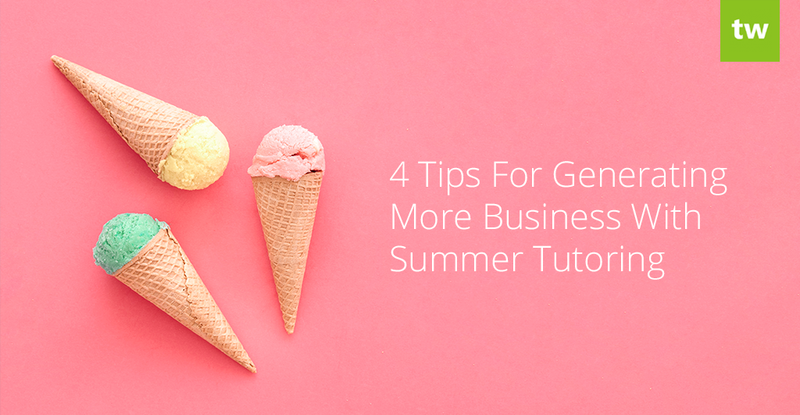 Instead of waiting for business to pick up again in September, why not use this time to be proactive and generate more business through summer tutoring? Summer learning loss (the loss of academic knowledge and skills that occurs over the summer holidays) can be combated by providing students with summer tutoring options. Some studies have indicated that students are less likely to experience learning loss if they’re able to partake in organized academic activities during the summer months. If you’re looking for ways to attract more customers and help students avoid learning loss this summer, we suggest the following strategies. Every year, working parents scramble to find summer programs or camps that can keep their children engaged and entertained. Use this to your advantage and host fun summer activities for your existing customers. Word-of-mouth can be very effective, so be sure to encourage them to let their friends know about your summer offerings. Summer vacation is synonymous with having fun, so think of fun activities to do with students that will also allow them to learn new skills or broaden their knowledge. For example, you could do an art project that involves an abstract version of Vincent Van Gogh’s “Starry Night”. While the students are crafting, you can bring in some art history and introduce the students to other famous artists. You may want to send out an eye catching email or two about your summer programs well in advance to make sure your customers are aware of it before signing up elsewhere. Teachworks offers a MailChimp Integration that allows you to sync your Teachworks contacts to lists in MailChimp. You can use their drag-and-drop interface to quickly create beautiful email campaigns. Some students, especially those with learning disabilities, are more likely to be impacted by summer learning loss. When school starts, they might fall behind and become frustrated and demotivated. Identify these students early on and arrange a personalized summer learning program for them before the summer vacation begins. Offering periodic summer tutoring sessions will really benefit these students and will help to thoroughly prepare them for the new school year. You can monitor student performance throughout the year and use our Follow-Up Add-On to remind yourself to follow up with these students closer to summer. Many of your customers will likely go on vacation during the summer break and may not be around to attend regular classes. For these customers, you may want to host multiple refresher courses to allow students to fit in classes around their vacation plans. Reach out to your customers ahead of time to find out if they would be interested in signing up for a refresher course. An easy way to gather this information is to send a poll or a survey to your customers. This can be done on Facebook, or if you’re using our MailChimp Integration, you can include a poll or survey in your MailChimp campaign by following these steps. A good way to get your brand in front of a larger audience is to use online advertising tools like Google AdWords or Facebook Ads. When setting up ads aimed at generating more business during the summer months, a good approach is to not make it look like a chore. Students (and parents) want to enjoy some well deserved rest, so it’s important to show that they can still enjoy their summer while also avoiding summer learning loss. For example, you could create a display ad with an eye catching image of a popular summer activity (such as swimming, visiting the park, playing sport, eating ice cream). You can then add text to the ad that explains that students can still enjoy their time off while staying on top of their studies and preparing for the new school year. Another good way to spread brand awareness is to host fun giveaways on social media. These posts tend to do really well and a small investment on a competition prize can yield lots of interaction with your brand on social media. The key is to keep these giveaways simple so that your current and potential customers are enticed to enter the contest. Need some inspiration? Here are some great summer-themed giveaway ideas. A seasonal lull is very common during the summer months, but a lot can be done to generate more business during this time. Take a proactive approach and provide your customers with options like summer programs and refresher courses that can help their kids overcome the negative effects of summer learning loss. Advertise your summer programs and services through tools like Google AdWords and Facebook ads to make sure it reaches a larger audience.